The Masters: Maintaining the Mystique. | A Continuous Lean. The Masters: Maintaining the Mystique. Baseball and Negronis are gifts that arrive with spring and keep on giving all summer long. The Masters, on the other hand, enters our lives and just as quickly departs, leaving us with just the sound of Jim Nantz’s ingratiating voice echoing in our ears. Brace yourself for the tinkling of the piano keys–the familiar theme is written by a certain Dave Loggins (which I really wish was my pen name). Yes, bless us all, tomorrow the Masters is back. If you think the reverential tone of the announcers is just for show recall that Gary McCord once told the television audience the putting greens were so fast they seemed â€œbikini waxed.â€ That was it for Gary–he was not given a mulligan–he was simply not asked back, cast into vulgar metaphor purgatory. You don’t mess with the Masters. It casts its hold on many of us who are not golfers or even, for that matter, really golf fans. What captivates us with the fervor usually reserved for BeyoncÃ© acolytes? 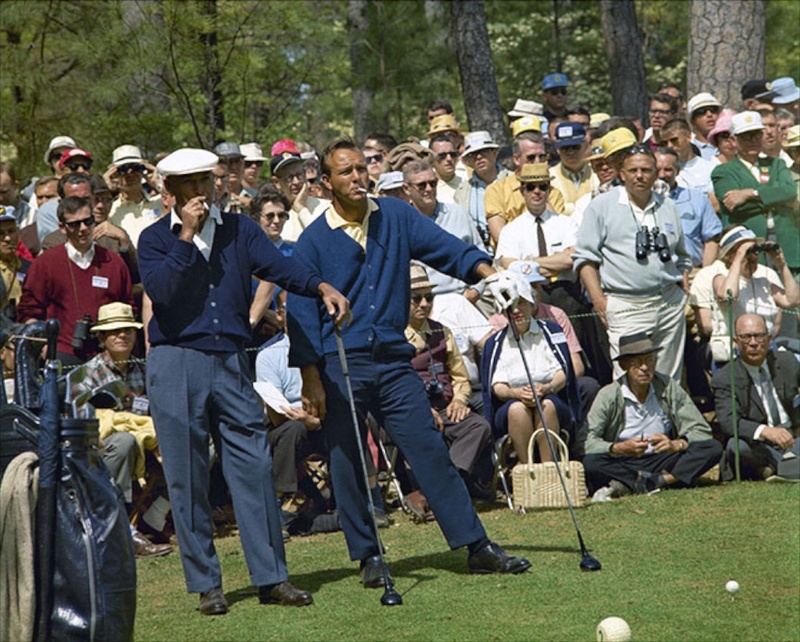 Well, the atmosphere, singular course and remarkable drama all create, as they say, â€œa tradition unlike any other.â€ Think of the Masters as a natural high that oscillates between low key whispering and acute drama. Arnold Palmer considers his options. Is this tradition enforced with a pageantry that’s overly sentimental? Hell yes! Why do grown men tear up watching an ancient Arnold Palmer hit the ceremonial opening drive down the fairway? I have no idea, but it makes strange sense at the time. This doesn’t happen by accident. These people, after all, run the most scenic golf course in the country, but it’s not so scenic that they aren’t above dyeing the ponds a more telegenic shade of blue. Yes, Augusta National works to maintain its aura. They keep a stranglehold on the televised production values as tightly as they enforce their membership (which, it goes without saying, is half a century or so behind the times). Unlike most sporting entities they don’t take all the money they can get, or even half of it. Watching the NCAA basketball tournament this past week was to be assaulted with ads at every conceivable turn. Tune in to a baseball game and there’s a sponsor for everything from the starting lineup to the call to the bullpen to the weather report. It’s relentless. That’s just the way the world works, we’re told, you can’t keep money out of every corner of sport. But the Masters proves it isn’t so. They have just a handful of sponsors, only four minutes of ads an hour and refuse to let CBS promote any of their dreadful sitcoms (they are allowed to mention 60 Minutes once on Sunday afternoon). They don’t even allow the blimp. And on a more humane note, they only charge patrons a few dollars for beer, (though apparently the members’ dining room has an outrageous wine cellar) and a Pimento cheese sandwich will only set you back $1.50. Are some of the traditions ridiculous? Of course they are, starting with the green jackets that are not at all handsome, in fact, they’re almost defiantly unflattering. But that doesn’t mean you can’t let yourself go and enjoy the game on your own terms. The Masters plays well with a bottle of Riesling. It plays well with a case of beer. It even plays well with a joint–Verne Lundquist has a special connection with those in altered states (â€œOh my!â€). In the end, the Masters understands that in a sporting culture racing to sell every inch of space and every second of airtime, there remains a price for mystique. And that price is worth paying. Seve Ballesteros and Craig Stadler “The Walrusâ€ in 1983. 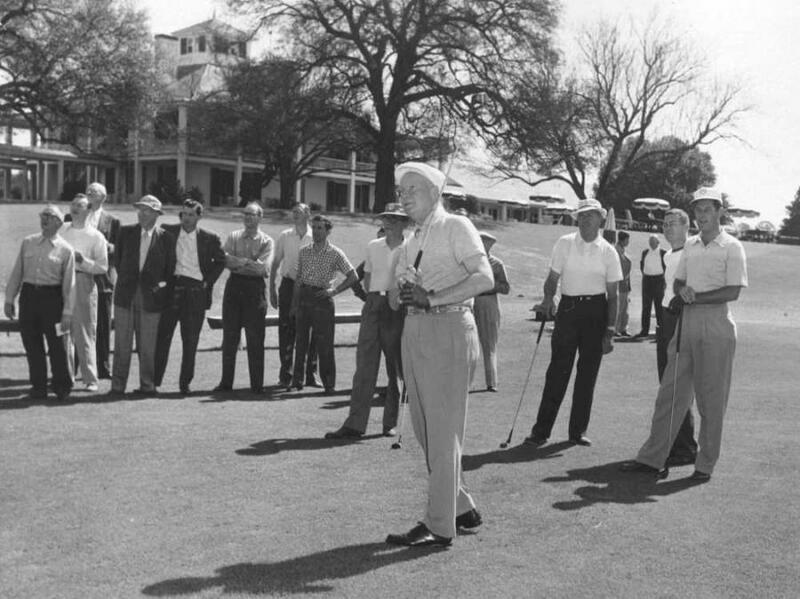 Dwight Eisenhower tees off at Augusta National. 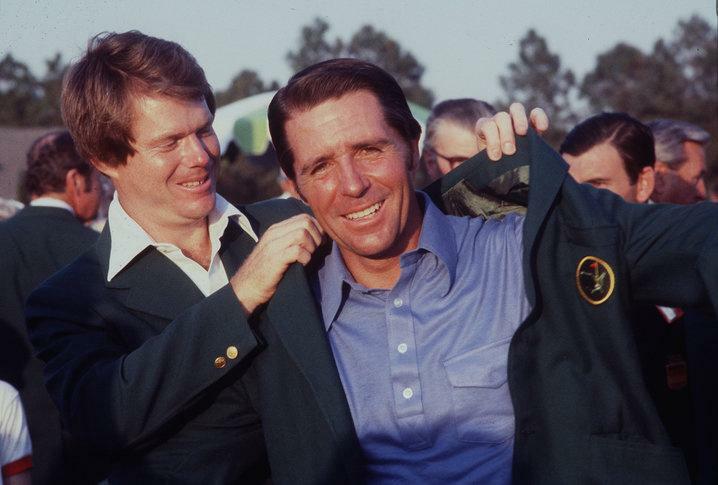 Gary Player dons the green jacket. 1978. 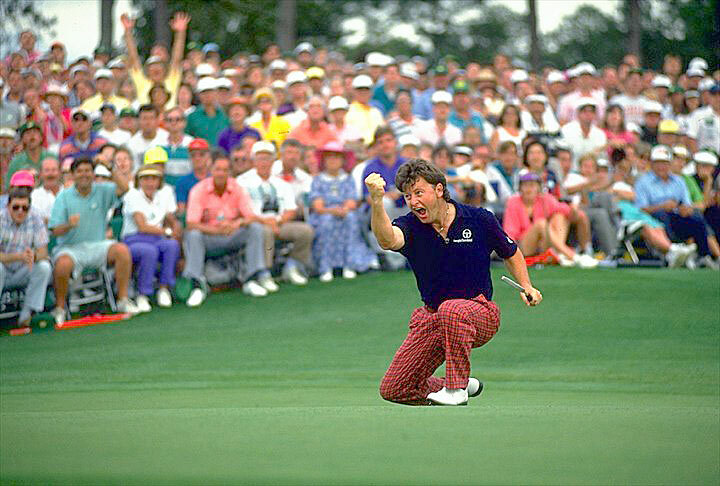 Ian Woosnam â€œThe Wee Welshmanâ€ at 5’4â€ wins in 1991. I find it interesting that a website that promotes personal style, quality and provenance along with a general celebration of more grand, dignified and august eras condemns the Masters as “half a century or so behind the times”. I understand that this is not the point of the article but they’re a private institution and should be allowed to practice whatever membership policies they wish. You don’t like the rules? Don’t watch / promote the Masters. Simple as that. I had the pleasure of going to The Masters last year, and I was absolutely blown away. It was an unforgettable experience. The grounds are magnificently manicured, the concessions are delicious and reasonably priced, and the level of customer service is amazing. It is an experience that everyone should have at least once in his life. Being a part of that kind of history is a rare thing in today’s society. While I admire the fact that the masters/agc has upheld their traditions, I do wish that the PGA and CBS would have higher standards when it comes to inclusiveness and basically told the club — look, admit women or we’ll cancel the tournament. That took till 2012. And they didn’t have a black member till 1990. Taken in that context a lot of the bloom comes off the Masters rose. And I think the tradtions like cheap cheese sandwiches look a little silly when the club was essentially a plantation for the first 75 years of its existence. Sorry folks The Masters would go on without or without CBS or the PGA……. Culture is moving one way, the masters is moving another. Culture always wins. I wish this post had commented more on the sartorial aspects of The Masters- other than those execrable jackets- and thus avoided invidious comments about membership. I’ve played golf since high school, and, while the sport is fun, it is as a spectator sport the epitome of the cliche about watching paint dry. Who watches golf on TV? The clothing, nevertheless, is a great topic from Arnie to Payne…with a few kilts thrown in between. OTOH, I shall never forget when Tiger Woods won his first Masters. I and a friend had taken my then-boss to play only a week or so before at our club. As a fellow Californian golfer, I was keen to see him win. The next day at the office I excitedly broached his scores with my boss. His silence was ear-splitting. Though he hinted, he received no further invites from me, since I have no truck with bigots. Then again, what can one expect of persons who actually eat $1.50 pimento cheese sandwiches? Culture is always moving one way, the masters is moving another. Culture always wins. its true ………. As the tide erodes the shore, with time, all things change. As Arnie considered his options, what do you figure Hogan was considering? That by 2015 he might not even be mentioned in the caption of the picture? Kind of amazing.